Fortunately, there’s help. Here is a quick reference designed to help you understand some of the most common kinds of coverages. Liability limits generally appear as three numbers, for example, 25/50/25 or 100/300/100. The first number refers to the maximum amount, in thousands, that your insurance company is obligated to pay for bodily injury per person. The second number is the maxi-mum that would be paid out for bodily injury per claim and the third number represents the maxi-mum amount your insurance company is obligated to pay for property damage you cause. Collision. When you buy collision coverage, your insurance company pays for damages if your vehicle collides with another vehicle or object. Collision coverage involves a deductible amount you select when you purchase your policy. This amount is what you are required to pay before your insurance company starts picking up the tab. 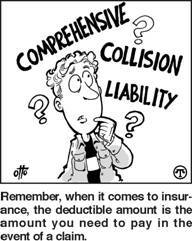 Remember, the deductible amount is the amount you need to pay in the event of a claim. Comprehensive covers dam-age caused by events other than a car collision—such as fire, theft, vandalism, hail or flood. It also covers damage caused by your vehicle colliding with an animal. And if your car is stolen, it will cover the cost of a rental, subject to a daily limit. Like collision coverage, a deductible usually applies. Medical Coverage. Depending on the state in which you live, you may have available to you Medical Payments coverage or Personal Injury Protection (PIP) coverage. While these both work differently, they provide coverage for medical care provided to you as a result of a car accident.